MedLinks has established itself as one of the major institutions in the area of skin and hair treatments. We have the facilities of most advanced and contemporary equipment and laboratory. With a pool of extensively trained professionals, we provide the world class facilities to our patients. if you have been wanting to consult the best dermatologist, skin specialist in Delhi(South Delhi), MedLinks is your ultimate destination. You can find below the details of our doctors. Moreover, the working staff at MedLinks maintain the cleanliness and hygienic conditions in the entire campus. Dr. Pankaj Chaturvedi is a dermatologist and specialist hair transplant surgeon in New Delhi, India. He did his specialist training, MD Dermatology from prestigious All India Institute of Medical Sciences (AIIMS) New Delhi. 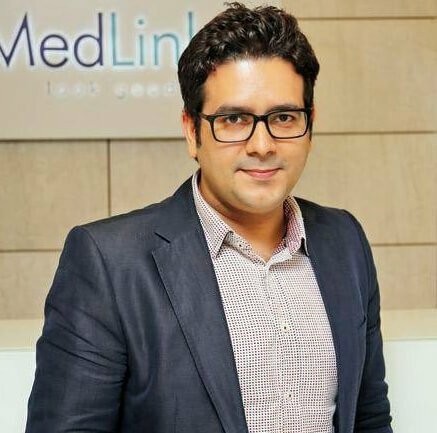 After his medical school, in 2010 he joined ADIVA Aesthetics as Director and Head, Dermatology and Hair transplants and later in 2013 co-founded his state of the art center – MedLinks which has consistently been a top destination for aesthetics treatments including cosmetic surgeries and hair transplants. Widely traveled, Dr. Chaturvedi has learnt the science of aesthetics from the doyens of the field. His signature face beatification technique “Face 360 ° ”, where he corrects the proportions, does re-volumization followed by skin tightening to completely transform the face has been appreciated at various International Platforms. Dr. Chaturvedi also has a keen interest in non-surgical body contouring and has designed special protocols by combining various technologies to deliver results comparable to surgical treatments. Dr. Chaturvedi is an official trainer for Allergan India and Sinclair USA (makers of Silhouette Soft, the only US FDA approved suspension thread for the non-surgical facelift in the world). He is also an adviser to Menarini Pharma Italy, Galderma, Sebamed and Dr. Reddy’s Labs. Currently, Dr. Chaturvedi is doing research on the use of stem cells and growth factors in reversing the facial aging process. Other than Skin treatments, Dr. Chaturvedi is also one of the most sought-after hair transplant surgeons in the country and is especially known for his hairline designs and high-density implantation. He has completed more than 2000 hair transplants with a high level of patient satisfaction. Dr. Gaurang Krishna is a specialist Hair Transplant Surgeon and Senior consultant dermatologist. 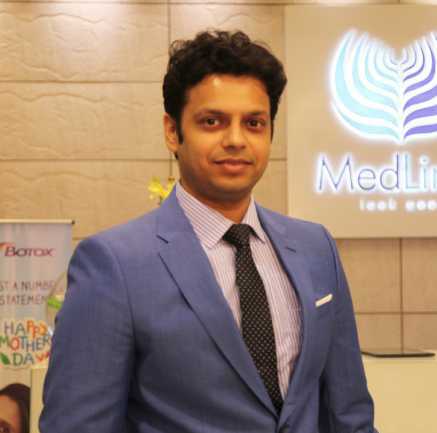 He is the co-founder and director of MedLinks, chain of Hair Transplant and Aesthetic Clinics. He has obtained his MBBS from TN Medical College, Mumbai and then did his Masters from the prestigious All India Institute Of Medical Sciences, New Delhi. He had a bright Academic record, throughout his career. He was awarded the ‘Best Resident in Dermatology’ at AIIMS after his post-graduation, an honour conferred to very few in AIIMS history. Post MD, he developed a love for trichology and then he specialised into Hair Transplant. Since 2011, he has evolved into being almost an exclusive hair transplant surgeon. In 2013, he was awarded the Best Hair Transplant Surgeon in Delhi/NCR by PrimeTime Media. He has been featured in multiple newspapers and magazines and provides inputs about emerging trends in trichology. He is an active social worker and works for various NGOs and governmental organisations for the health of the poor and deprived sections of the society. He has won many national and international awards, like WCD Rising Star Award, ISD fellowship award, National Dermatology Quiz winner etc. Best Hair Transplant Surgeon Awarded by PrimeTime Media in 2013 Delhi NCR. Best PostGraduate in AIIMS in 2010. Accepted visiting scholar at the University of San Francisco, California, USA. Accepted International Doctor- (for dermatosurgery)- Sao José do Rio Preto, Brazil.